Let a Cain Bull be a Baldymaker For You! Balance, Growth, Maternal, Fleshing Ability AND Feed Efficiency. All with proven Calving Ease! CSU Ram Dominator 4203 (Horned), (*reg 42531422): “RAM” is sired by the Breed’s Top Balance Trait Sire CJHL1 Domino 552. He is 552’s Highest valued son. Combining 552’s Birth, yearling, milk and REA with Jet Domino that adds marbling. Awesome disposition, color, hair and fertility. RAM finished the National Reference Sire Evaluation Program where he proved himself as a high accuracy Reference Sire Trait Leader for Calving Ease, Birth Wt, Marbling, REA, Backfat and the Profit Indexes for Baldy Material, Brahman Influence, Calving Ease and Certified Hereford Beef. This makes RAM and his offspring a confident, best choice in Breeding heifers and creating that all-important F1 Black or Red Baldy! He is truly “Right for the Industry”! Cains Ram Domino 7004R (Polled), (*reg. 43316244): A massive polled “Ram” son out of a great “0270” cow. Combining all of Ram’s performance with Feed Efficiency and he’s Polled! You will drive your wheels off to find a polled bull like 7004R. Cains New Trend 6617D (Polled), (*reg 43110356): “6117D” is an 0270 son out of a fault free “552” daughter with a perfect udder. 100% Cain bred with a great disposition, depth and capacity. Cains Domino 0270 (Double Polled), (*reg 42140513): “0270” is a rare, thick ‘A’ type, easy fleshing and double polled sire. A GeneStar top Hereford trait leader for Feed Efficiency. You don’t find polled bulls like him. His sons will really give fleshing ability and efficiency to your herd. With excellent calving ease and tremendous growth. A line bred Tradition pedigree (hard to find in polled cattle) resulting in consistency! Cains Victor Domino 5189 (Double Polled), (reg pending): “5189” is an 0270 son out of a solid Victor cow, Elton Erickson’s favorite of Kensington MN. Cains Double Time 0155 (Double Polled), (reg. 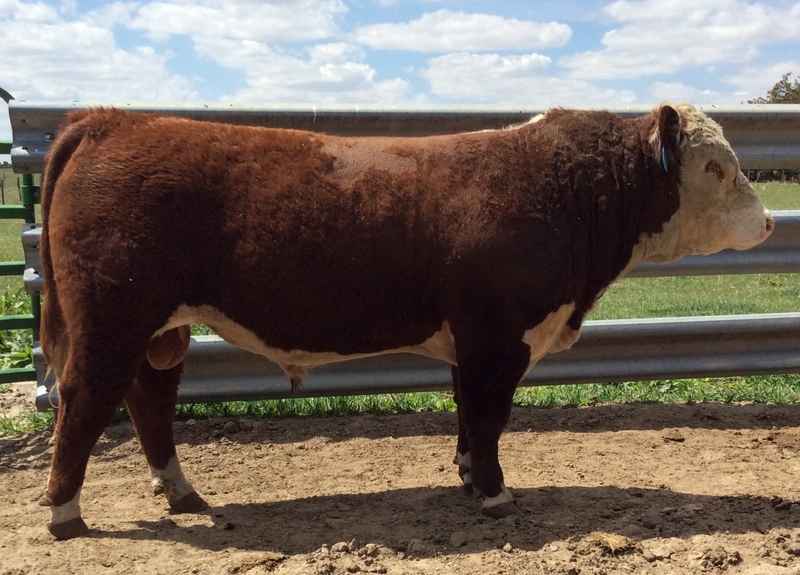 pending): “0155C” is a Double bred 552, extreme “A” type and a top Efficiency tested Bull. The pedigree says he will do it and he did. 100% Cain bred and heading in the right direction. KJ BJ 240 W Power 001A (Double Polled), (*reg 43443073): "Power V", Our Purchase from Kevin Jensen. Double bred RH MR Felt with Victor P606 on the top & 552 on the bottom. Excelling in REA and marbling while keeping cow size moderate and BWT low. His pedigree and shape fit our program to a "T"! 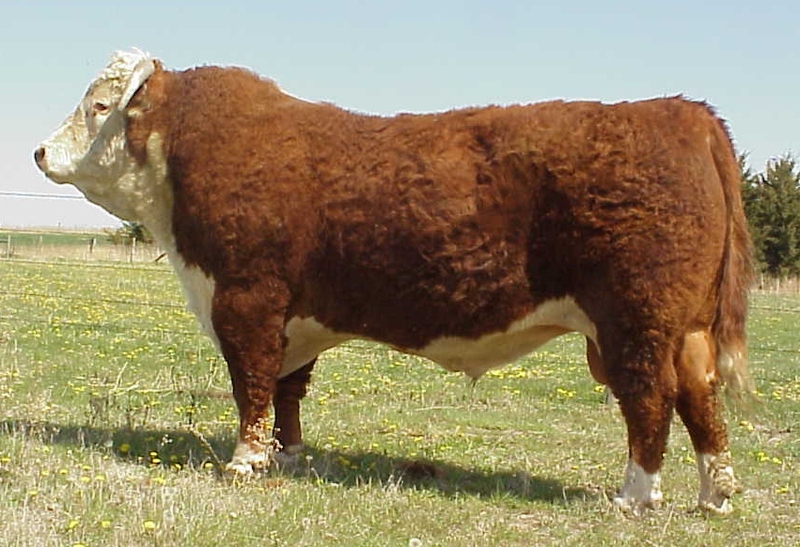 See this year's offering of Hereford bulls. Listed in Lot order. See this year's offering of Red Angus Bulls. Listed in Lot order.